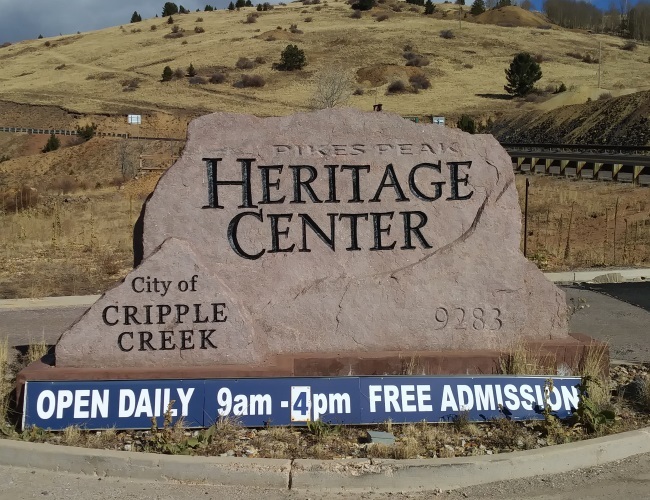 The exterior of the Pikes Peak Heritage Center was designed to resemble the entrance to a mine shaft, as well as town buildings before and after a catastrophic fire. The town of Cripple Creek was built quickly to accommodate the thousands of gold miners who arrived between 1890 and 1900. Early buildings were hastily constructed of wood cut from nearby forests. In April 1896, two fires swept through the town. Many wood buildings were lost, but the residents were undaunted. They learned a valuable lesson, and rebuilt the buildings using brick. The buildings on either side of the mine entrance show the wood building as it would have looked before the fire, and brick buildings that were built after the fire.